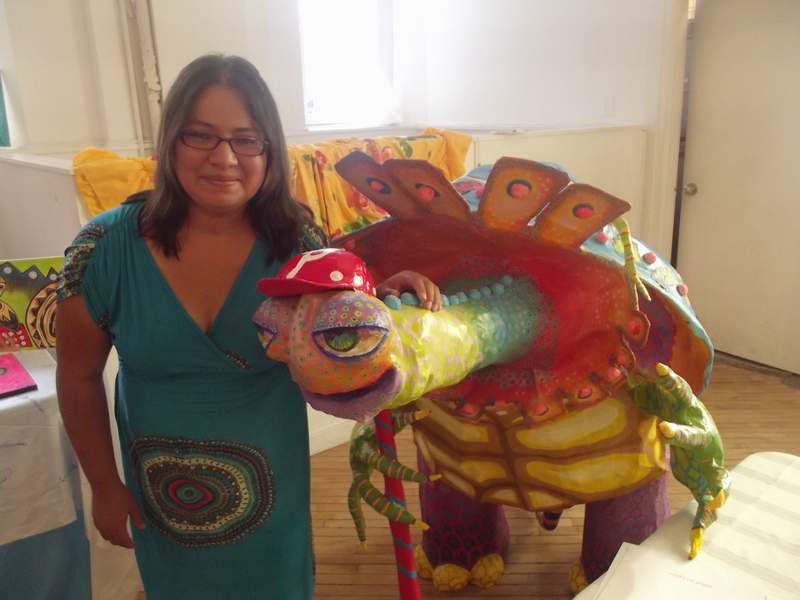 Philadelphia – An extensive exhibition of the works of more than twenty emerging Latina artists was offered by Raices Culturales, Friday, at 1417 N. 2nd street, the spacious Crane Arts Building headquarters of Raices. A showcase of an eclectic selection of paintings, photographs, sculptures and textile weavings from artists who are either recent immigrants or influenced by their Latino heritage, the collective works were, at best, an illustration of Mexican Muralist Jose Orozco’s belief in the “glorification of the indigenous’ culture and folklore. 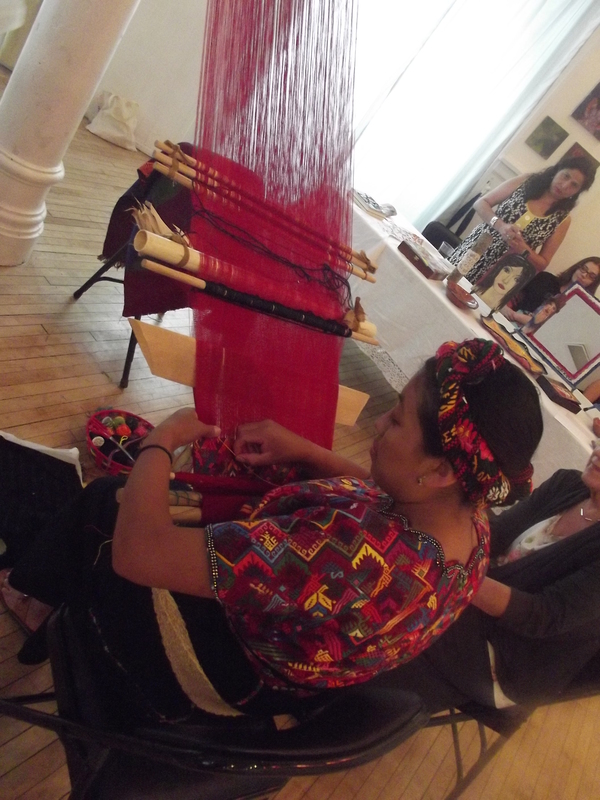 A pair of Guatemalan Weavers, Angelica Lopez and Orlandina Hernandez dextrously wove their ornately festooned tapestries, as a cluster of women watched with admiration the exquisite craftsmanship that our Central American neighbors preserved, the same way other cultures preserve wines and classic arts. 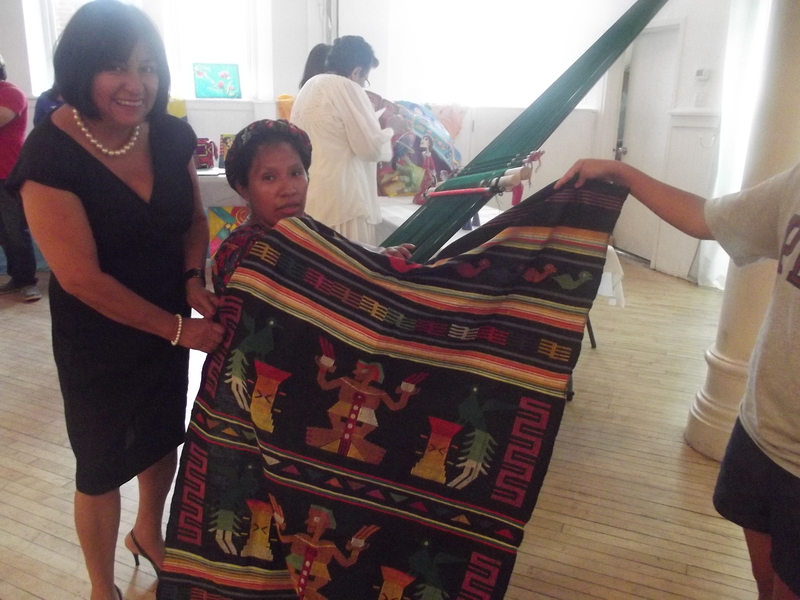 Although the pieces can often take more than a week to complete, Ms. Lopez offered to sell one 6’ by 5’ garment for $50.00. Inside the central room at the Crane Arts, a line of diverse photographs revealed the premiere works of a group of Latinas, most of them recognized professionals with careers as heads of community organizations, teachers and social workers. In her Regaldo de Vida,” Dalia O’Groman captured the face of her nephew, Axel Armenta of Guanajuato, Mexico, gazing in fascination at a caterpillar on his arm. The photo exudes a sort of delight and exuberance that one feels in discovering something novel. Carmen Marcet’s Brazos Al Sol is a sort of landscape piece that ruminates languorously over the fading light around the leafless branches of a tree..
Mexican-born (Veracruz) artist Ana Guissel Palma, takes ordinary paper, corn paste and natural pigments and turns these mundane items into magical Las Catrinitas, animals and decorative items. In this traditional Mexican art, Ms. Palma has taken the gruesome and gloomy topic of of our inevitable demise and by adroitly molding her figurines, has conveyed a decidedly comical and grinning retort to the grim reaper. A disciple of another Mexican-born artist, Cesar Viveros, Ms. Palma’s talent has earned her showings at the Philadelphia Museum of Art and University of Penn Museum. Already among the virtuoso Muralists in the city of Philadelphia (3rd and Girard), Mr. Viveros has been engaged to paint a three-story mural on the southern wall of the Crane Arts bldg., a few yards from the historic Iglesia de San Miguel. Aligning her works in the foyer of the Crane Arts, novice painter Sonia Delgado says she turned to painting for therapeutic reasons, and found an irresistible passion. “I’m obsessed,” she said laughing. Beginning with a heavily lacquered blue piece, Ms. Delgado’s works have advanced to an array of remarkably polished and colorful paintings and decorative tablets that are picturesque, nearly surrealistic, reflective and allegorical. Both former Exec. Director Yolanda Alcorta -now based in Washington, and the current Director Mary Rivera introduced the group of artists. Building a "Beautiful City": Public Investment & Philadelphia Labor. 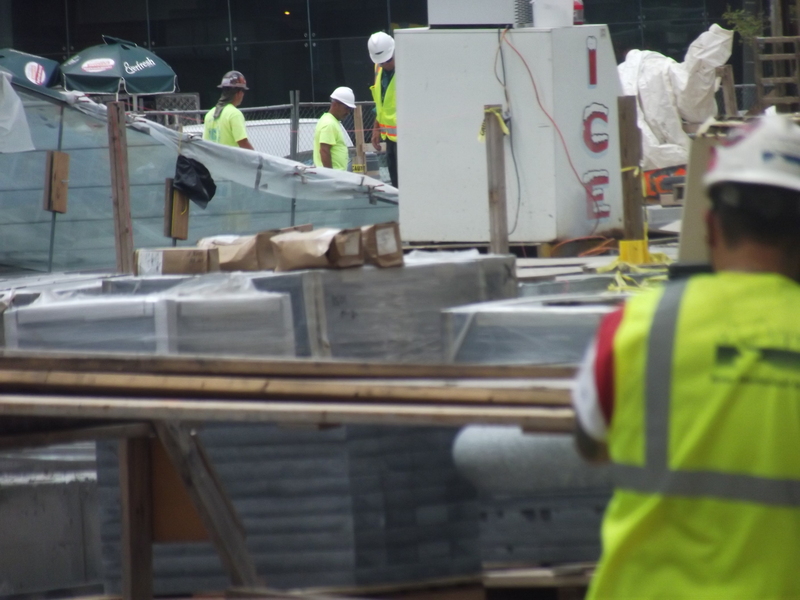 Philadelphia – “It’s going to be beautiful,” Chris Cruz told El Hispano as he exited the fenced-in construction site of the Dilworth Plaza Renovation Project. A $50 million dollar project supported by federal, state, city grants and Septa investments, a slate walkway and trees aligning the perimeter are early glimpses of what will eventually be a burnished and revitalized west side of City Hall, linking it seamlessly with the Septa’s 15th Street station and Amtrak’s Suburban Station.. Looking for an administration in Harrisburg that will promote similar public works and infrastructure improvement projects for Philadelphia, Allentown, Reading and elsewhere, the Pennsylvania State Building and Construction Trades Council recently announced the “unanimous” endorsement of Democrat Tom Wolf for Governor and running mate Mike Stack for Lt. Governor. Describing Democrats Tom Wolf and Mike Stack as voices of “welcoming reason,” who will return “fairness and progress to our society,” Mr. Sirianni referred specifically to what changes he would expect in a Wolf and Stack administration: from strengthening communities through wages for “working families,” and improved “access to healthcare for all, to “rationally protecting our resources,” and “enhancing the quality of education” for children. While Latinos nationally have grown to nearly 16 percent of the total population, they represent more than 20 percent of some of the nation’s most essential industries: from construction and extraction jobs, to farming, fishing, cleaning, food preparation and transportation of goods. In calling for more investment in infrastructure projects, Tom Wolf has noted that the poor condition of the state’s roads costs individuals and businesses up to $3 billion. Besides seeking to leverage private dollars and be an aggressive “advocate” for federal infrastructure investment, as well as demanding “more flexibility in how those dollars are used,” Mr. Wolf stressed the fact that 30,000 good paying jobs are produced for every $1 billion invested in infrastructure. That infrastructure investment will include significant support for mass transit systems throughout the state, according to Stack Legislative Aide Juvencio Gonzalez, who declined to comment on the campaign, but referred to the Senators past record. Gov.Tom Corbett has also called for a multi-billion infrastructure repair program which he says will produce 50,000 jobs. The most recent survey of Pennsylvania roads and bridges revealed that 20 percent of state-owned bridges (4,449) and one-third (2,234) of county-owned bridges were structurally deficient; and that 37 percent of state and locally owned roads were in “poor or mediocre” condition.